Cool stuff for around ten dollars or less. 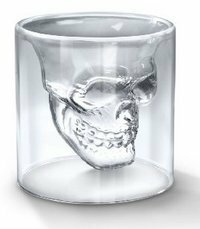 This Skull Shot Glass is a great gift for anyone that likes skulls. Or anyone that likes to drink. That pretty much sums it up. Or grab a few of these for your next party and place them on a table for people to use. I guarantee people will be happy and excited to see them, let alone use them! Each shot glass holds a massive 2.5 ounce shot – though there is nothing saying you have to fill it to the top…. Made from hand blown glass and ships in a nice gift box so a perfect and easy gift. Not just a shot glass though! Gave one to my son as a regular glass for a Christmas present and he loves it. He loves skulls and I really enjoy seeing how the different color liquids look in his “glass”. This is a nice change from all the double wall glasses out there. Product is as advertised…will make an excellent part of a Father’s Day gift! Exactly what we were looking for. ??? ?